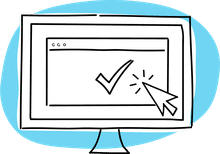 Point and click is usually the preferred method for adding cell references to a formula or function as it reduces the possibility of errors introduced by misreading or by typing in the wrong cell reference. This method can also save a lot of time and effort when creating formulas since most people see the data they want to add to the formula rather than the cell reference. These steps apply to all current versions of Excel, including Excel 2019, Excel 2016, Excel 2013, Excel 2010, Excel 2019 for Mac, Excel 2016 for Mac, Excel for Mac 2011, and Excel Online. Type an equal sign ( = ) into a cell to start the formula. Select the first cell to be added to the formula. The cell reference appears in the formula and a dashed blue line appears around the referenced cell. Press the mathematical operator key on the keyboard (such as the plus or minus sign) to enter the operator into the formula after the first cell reference. Select the second cell to be added to the formula. The cell reference appears in the formula and a dashed red line appears around the second referenced cell. Continue adding operators and cell references until the formula is finished. Press Enter on the keyboard to complete the formula and view the answer in the cell. A variation on point and click involves using the arrow keys on the keyboard to enter cell references into a formula. The results are the same and it is really only a matter of preference as to the method chosen. 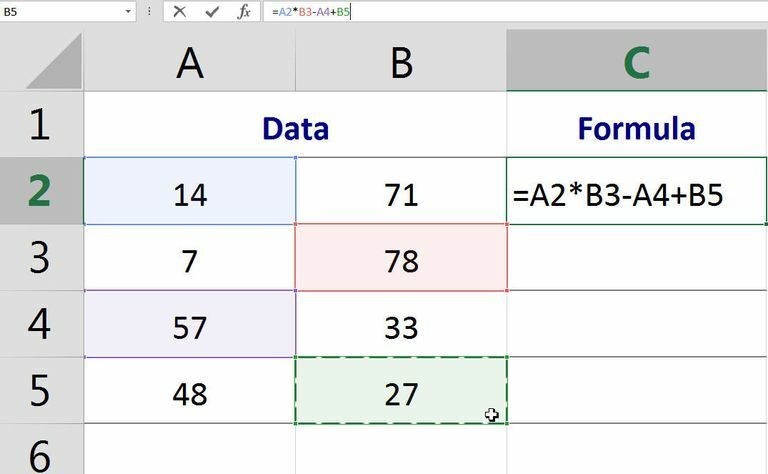 Type an equal sign ( = ) into the cell to start the formula. Use the arrow keys on the keyboard to navigate to the first cell to be used in the formula. The cell reference for that cell is added to the formula after the equal sign. Press the mathematical operator key on the keyboard, such as the plus or minus sign, to enter the operator into the formula after the first cell reference (the active cell highlight returns to the cell containing the formula). Use the arrow keys on the keyboard to navigate to the second cell to be used in the formula. The second cell reference is added to the formula after the mathematical operator. If required, enter additional mathematical operators using the keyboard followed by the cell reference for the formula's data. Once the formula is complete, press the Enter key on the keyboard to complete the formula and view the answer in the cell.